Oh lookie-lookie…we’ve got a great quick project that we just finished up and want to share with you!! 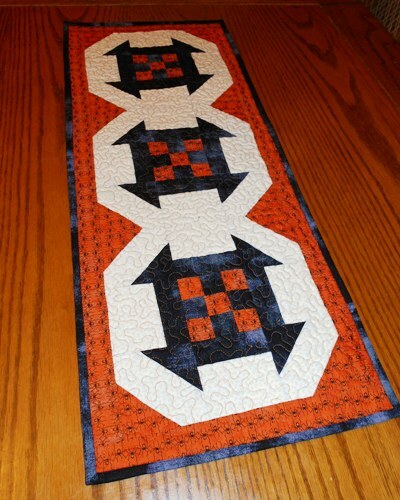 A Halloween Table Runner…. 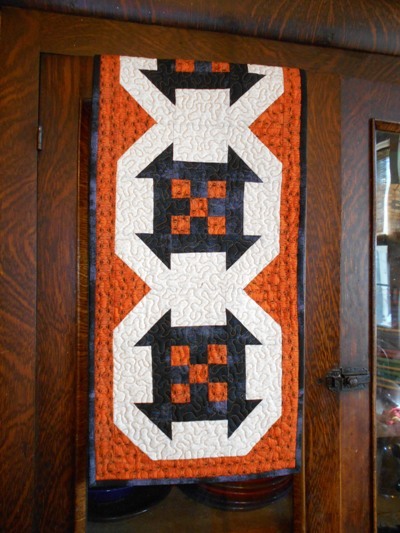 Kelli has been busy sewing a quilt that is a part of Quiltmaker’s 100 Blocks issue that will be coming out this fall. 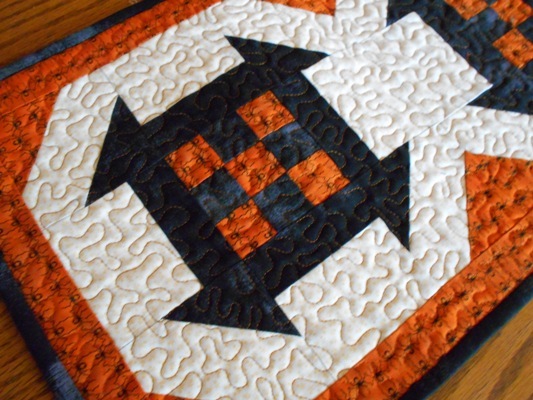 She was making a quilt in Halloween colors using Moda’s line Eerie. It’s a great line. The colors are deep and rich and don’t have the obnoxious Halloween look. When Kelli finished that project there was left over fabric and that got me thinking. I am not a Halloween decorator. I do like decorating with the season though and thought maybe I should start making a few things for the new house…why not start with something for Halloween? It will be so nice next year when Halloween rolls around to have something to put out. Then we though as long as I was making one, we might as well write up a pattern and share it with you….so here is my new table runner…. I love it. the colors are perfect. Can you see the little spiders in the orange print. So cute!! I did substitute in a cream that isn’t from the fabric line. There wasn’t enough white left over from Kelli’s project…so I searched the stash and came up with this cream. Here it is hanging over my kitchen cupboard door. 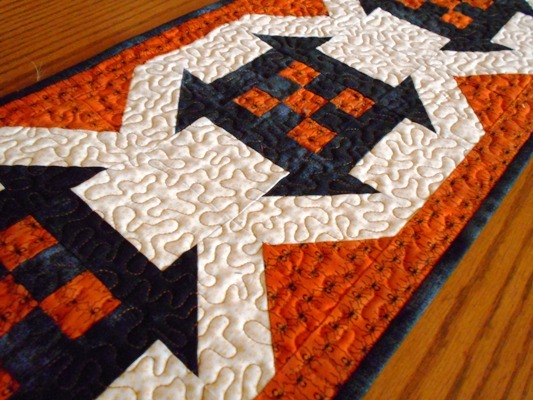 The quilting is just a small meander….nothing fancy at all but I think it looks good. I debated on thread color and ended up using a gold. I think it was a good choice. 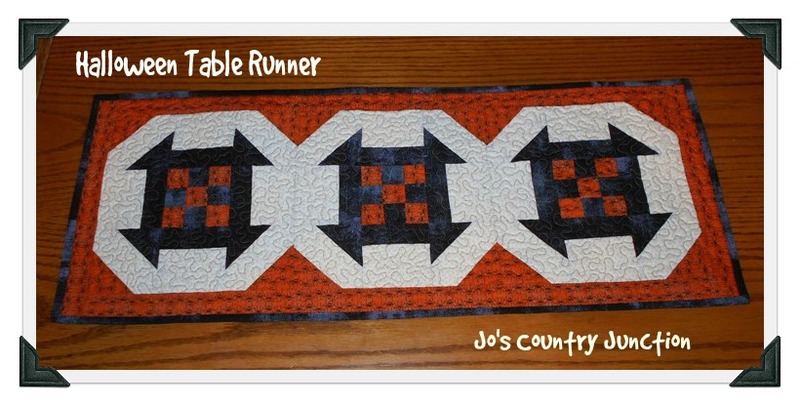 We put together a easy to read pattern to make the table runner. You can find it by following this link. This has me thinking I could change the colors up and make one for other seasons as well…but then again, maybe I’ll just design something completely different. Enjoy the pattern and make sure to stop back next week. We have another free pattern planned. Last Friday we had published a free pattern (find it here) and by Sunday I got a text from my friend Nell. She already had sewn all the strip sets together!! WOW. As always..if you make one send me a picture…I’d love to share it on the blog.